I remember the day that Jacob Zuma announced fully subsidised free education. There was a mixture of excitement and confusion on social media, but for the most part what I felt was anger, writes NALEDI MASHISHI. The haphazard way the announcement was made at the end of a press conference, the manner in which it contradicted the report released by the department of higher education and training (DHET) only a few months prior which stated that free tertiary education was economically unfeasible, and the fact that it was clear that the Treasury had not been consulted beforehand all indicated that this was a promise that was never intended to be kept. It is no small coincidence that universities were already closed for the year when Zuma made the announcement. With no prior indication that tertiary education would be made free, universities had no adequate time to prepare. Over the past two years we have been watching the repercussions of Zumaâ€™s announcement. Less than a month into the 2019 academic year there have been widespread protests at universities across the country. A student named Mlungisi Madonsela tragically lost his life after being shot by private security guards while protesting at the Durban University of Technology. The University of KwaZulu-Natal suspended all lectures after protesters torched a security vehicle. At Wits University, the University of Johannesburg, and the Central Johannesburg College, protesting students have been met with stun grenades and tear gas by private security guards and police. The students are largely protesting for the same thing: the scrapping of historical debt, access to accommodation, and for students who are unable to pay registration fees to be allowed to register. The collective response from the universities has been to turn out their pockets and insist that they donâ€™t have the money to meet the studentsâ€™ demands, so pay up. Our universities are not the only institutions which have shouldered the brunt of the â€˜free educationâ€™ announcement. The National Student Financial Aid Scheme (Nsfas) has been in a state of crisis which culminated last year when the board was dissolved by Minister Naledi Pandor after the chairperson, Sizwe Nxasana resigned. Frustrated students have taken to social media to report that the already overburdened financial aid scheme has failed to respond to applications, fund students that were funded in previous years, and pay out for beneficiaries leaving some students, as is in UKZNâ€™s case, unable to register. Of course, none of these issues would be issues if tertiary education were free. The longer the protests continue, the more apparent it is that students are responding in anger not just to the institutions, but to the realisation that they have been duped. Their emotions and their futures were gambled in a game of petty politics, and the real losers here are them. Realistically speaking what can universities do? The reality is that tertiary institutions are not sitting on a giant pile of money that is not being used because they lack the political will. However, the manner in which universities have responded to this problem has largely been violent. 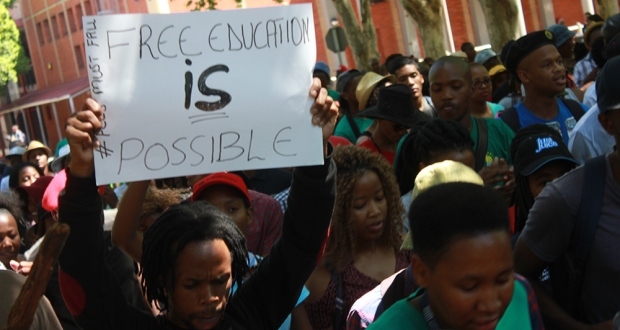 From employing untrained private security, to ordering students and staff to continue with business as usual regardless of protest action, to â€“ in Rhodes Universityâ€™s case â€“ reintroducing financial exclusion after declaring in 2015 that no academically deserving student would not be unable to register due to owing fees, universities have increasingly sacrificed students in order to keep themselves afloat. What is clear is that another approach is needed. The ongoing student protests have often been framed as a battle between students and universities, when ultimately both parties have been let down by the same institution. Rather than taking a reactionary approach, universities need to be more visible in pushing government to take responsibility for the situation they have put tertiary institutions in and provide the free education that has now been promised to students. This means standing alongside students in their demands for free education, rather than closing ranks behind a wall of private security guards. What is evident is that our universities cannot continue like this. We cannot continue to see standoffs between students and universitiesâ€™ top management end in teargas and arrests while the government continues to chronically underfund tertiary institutions. If universities hope to move forward we need to see from them a greater and more public commitment to calling on government to shoulder the responsibility for the promise they made. The views expressed in this article are that of the author and do not necassarily reflect the editorial policy of The Daily Vox. Featured image via Raeesa Pather. Take the fight to parliament and the Union Buildings! Burning down your own campus isn’t going to solve your problems for pete’s sake! The universities are duty bound to defend their infrastructure by any means necessary and these idiotic rioters just continue to bark up the wrong tree. If you stop burning and breaking and start targeting the right institution you might actually achieve something. I have no sympathy whatsoever for people who throw rocks and burn things, people who do that belong in jail – NO EXCEPTIONS!